As a woman, I’m incredibly aware of how hormones affect my body. In fact, it’s pretty impossible to ignore! Yet, besides the obvious premenstrual syndrome, there are certain things that are especially influential on your hormones such as starting, switching or going off of birth control, exercise, and, one of the most triggering for me, changing diet. In my search for natural ways to keep those buggers balanced and keep my moods stable, I began stumbling across studies eluding to a connection between the gut and hormones. Well, this was somewhat new to me so of course, I had to find out more! Here’s what I learned. Before launching into the science behind the gut (or microbiome) and hormone connection, let’s take a quick review of both of those systems. If you’ve followed my articles, then you may already be pretty familiar, but for those who aren’t here’s a little 101 to get you started. Basically, one refers to the entirety and the other refers to the individual or more detailed version of the former. In this article, we’ll focus on the microbiome. The microbiome is very similar to a “mini-ecosystem” in which microscopic organisms thrive. These microscopic organisms, also called microorganisms, create a symbiotic environment called the microbiome and they include “bacteria, pathogens — infections agents, — archaea — prokaryote microorganisms, which lack a nucleus, — and eukaryotic microbes — microorganisms that have a nucleus.” Your microbiome is built from your personal environment and lifestyle, such as “geography, health status, stress, diet, age, gender, and everything you touch,” therefore every human’s microbiome is special and unique to them. These are the hormone-producing glands within your body, but what about the actual hormones? Alright, so here we are at the crux of the education, the gut-hormone connection. How in the world are these two systems connected? One of the main connections between gut health and hormone function was discovered in the hormone estrogen. It’s a lot of scientific terminologies to say that a healthy microbiome keeps your estrogen balanced and functioning appropriately. So, what happens when your gut is unhealthy? As we learned in the hormone section, estrogen is an integral part of a woman’s reproductive system, but this crucial hormone also plays a role in cardiovascular health, bone turnover, cell replication, and it regulates body fat (deposition and adipocyte differentiation). When your gut microbiome is unhealthy or unbalanced — also referred to as gut dysbiosis — your estrobolome (those lovely gut microbes that metabolize estrogen) may be altered leading to chronic diseases such as obesity, cardiovascular disease, osteoporosis, endometriosis, polycystic ovary syndrome (PCOS), and some cancers such as breast, ovarian, and cervical. Other theories stipulate that the gut-hormone connection may have a lot to do with inflammation. Leaky gut — a digestive condition where bacteria and toxins pass through intestinal walls — has the ability to trigger your body’s immune response. This trigger may lead to chronic inflammation as some molecules that aren’t supposed to cross that barrier are now able to do so. This state of chronic inflammation has been linked to an imbalance in hormones. How Does Gut Disruption Occur? You can probably already guess the answer to this one. Outside of medical conditions and diseases, the main factors that can disrupt your gut health are diet and lifestyle. This includes unnatural agents, such as “antibiotics and hormonal contraceptives”, as well as natural agents, such as some types of phytoestrogens, also called dietary estrogens, these are compounds that naturally occur in plants. With that said, there are medical conditions — from less urgent issues such as Gastroesophageal Reflux Disease (GERD) to very urgent and sometimes life-threatening conditions such as Celiac Disease or Crohn’s Disease — that may cause unhealthy gut microbiome and imbalanced hormones. Therefore, if you are experiencing digestive discomfort or major hormonal symptoms, it’s incredibly important to see your health care provider as soon as possible! While healthy habits around the physical act of eating are important — feasting with a community, sitting, slowing, and enjoying each bite, and finding a calm peaceful state — what you are eating is even more important. The more and more I’ve read about the microbiome, the more I’ve learned that our ancestors, those that ate the food primarily from the land they lived on, were doing something right. This idea is upheld in a newly published book called Cultured. The author and journalist, Katherine Harmon Courage, explores how foods from our past — such as kefir, kimchi, and whole fat dairy products — play a key role in sustaining a healthy microbiome. Yet, for those of us practicing a plant-based diet, some of these ancient-wisdom food items don’t quite fit. No fear! There are a host of options for us plant-based eaters out there to help feed our gut, balance our hormones, and keep us on our plant-based path. No matter where you go for gut healthy food recommendations, you’ll find that fermented foods (think sauerkraut and pickles) top the list. It’s all about fermentation, the “process of using microorganisms, such as bacteria or yeast, to convert carbohydrates to alcohol or organic acids under anaerobic conditions.” Fermented food is basically the first step of digestion, therefore eating fermented foods is not only easy on the digestive tract, but they are also high in fiber, which is one of the main meals for gut bacteria. Kimchi is a traditional staple of the Korean diet and can be made in a variety of ways, but the most common kimchi recipe uses cucumber, radish, scallion, red chili paste and/or red pepper powder, garlic, ginger, and, the main ingredient, napa cabbage. Basically, kimchi is sauerkraut with a red-hot kick and sweeter flavoring. Not only is kimchi good for the gut, but it also helps increase immunity. Plus, it’s high in antioxidants and fiber, and low in calories, so it helps stave off those hunger cravings. On top of that kimchi, is super easy to make at home. Try out one of these simple DIY kimchi recipes — Homemade Kimchi or this How To Make Your Own Kimchi — yet, remember you’re fermenting the cabbage, therefore be prepared to let your kimchi sit for up to five days. You can also purchase perfectly good kimchi at the grocery store or even online, such as this gluten-free Seoul Kimchi. Once you’ve got your kimchi, eat it raw or try it out in a recipe, such as these Kimchi Potato Pancakes, this traditional Korean Soybean Paste Stew, or this Ginger Carrot Daikon Kimchi. 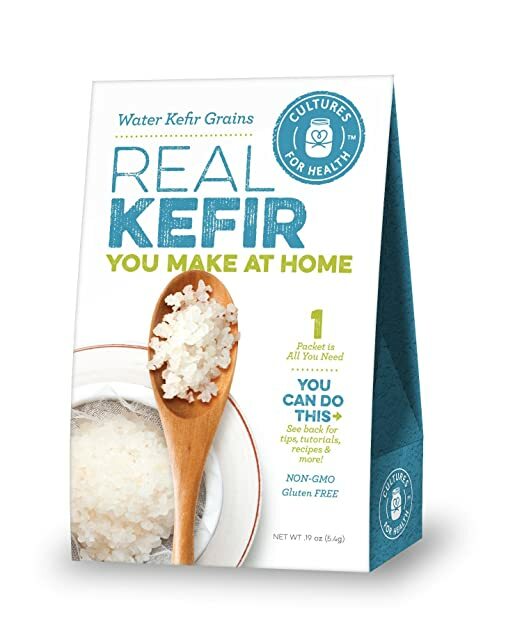 Traditional kefir is “a cultured, fermented beverage that tastes a great deal like a yogurt drink.” The key to kefir is the starter concoction of “yeasts, milk proteins, and bacteria.” It’s great for your gut due to the fact that it’s loaded with probiotic health benefits. Yet, if you’re following a plant-based diet, traditional cow or goat milk kefir may go against the grain. You’re in luck! Kefir can also be made with coconut. To avoid the milk-based product, try making your own coconut-based kefir using a non-GMO starter kit or an organic starter kit. For your own DIY coconut kefir, you’ll also need an actual coconut. Simply follow these easy directions provided by Heather McClees, a certified nutritionist, dietetic specialist, and writer for One Green Planet. There are a plethora of foods that kick your gut into a healthy, bacteria-filled environment. Yet, it’s important to consider foods that not only adhere to your personal taste preference, but are also easy to integrate, are overall great for the rest of your body, and are simple to consume. This is why I think oats may be one of the best gut-friendly foods on the shelf! Along with feeding your gut microbiome, oats offer a spectrum of nutrition including manganese, phosphorous, magnesium, copper, iron, zinc, folate, vitamins B1, B3, B5, and B6, calcium, and potassium. Oats also offer protein, healthy fat, and fiber! On top of the basic nutritional value, oats have a high level of avenanthramides, a unique group of antioxidants linked to lower blood pressure and anti-inflammation. Plus, oats are a great plant-based recipe ingredient. Start your day off with this Winter Ginger Lemon Oats recipe, snack on these Sesame Banana Power Balls, dine in with this Vegetable Rose Tart with Cheesy Sun-Dried Tomato Filling with a side of Whole Wheat Oat Bread, and finish of the day with these simple Ginger Oat Biscuits. For more gut boosting, hormone balancing foods, we highly recommend downloading our Food Monster App, which is available for both Android and iPhone, and can also be found on Instagram and Facebook. The app has more than 15,000 plant-based, allergy-friendly recipes, and subscribers gain access to new recipes every day. Check it out!